Killerspin are a Chicago-based firm in the USA who produce premium-quality table tennis equipment, sports apparel and media. They aim to bring youth and innovation to the sport of table tennis and to serve the table tennis player. In 2011 I caught up with Roger Payne, their Brand Marketing Director, and managed to ask him a few questions about Killerspin. Q. Please tell us about the history of Killerspin. A. Killerspin was started in 2002 by Robert Blackwell Jr in Chicago, Illinois, because he had a passion for the sport and saw potential of table tennis growth. Killerspin now have around 15 staff at our head office for marketing, sales, operations, customer support and back office. Q. Who designed your distinctive logo? A. Our logo was designed by Killerspin and its President, Robert Blackwell Jr. The player figure in the Killerspin logo is Liu Guo Zheng from China. Q. Please tell us about your table tennis expertise and what Killerspin can offer to customers. A. The current owner (Robert Blackwell Jr) is one of the most enthusiastic table tennis players around, and there are several staff members who are table tennis players. Killerspin encourages all it's employees to play table tennis at some level and we also run camps and events, usually hosted by our players and employees who act as excellent brand ambassadors and coaches. Our athletes compete at all levels and they're known as the "Killerspin Krew". We offer advice about table tennis equipment to customers all the time and we are actively growing a open forum/community concept to drive more conversation about the sport. Q. Who are the key people in your organisation? Q. Can you tell us who your table tennis products are aimed at? Are they just for serious players or are they for everyone? A. The Killerspin brand is positioned as a premium product, however we do offer variations for each product we offer. Our goal is to introduce people to the sport using entry-level items and have them move up the ladder as their abilities and passion grow. Q. 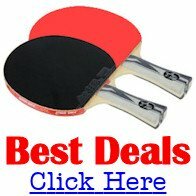 Please tell us about the Killerspin brand of table tennis equipment, and where it is made. A. We decided to have our own brand of table tennis equipment because we felt (and still feel) that there is a void in the marketplace for a table tennis brand that is more daring and edgy than the typical equipment offered to the public. We strive to show the Killerspin brand as a "cool" alternative to the standard, along with a higher quality of production. Killerspin products are manufactured in the USA, France, Hungary and China and can be shipped to customers worldwide. Q. 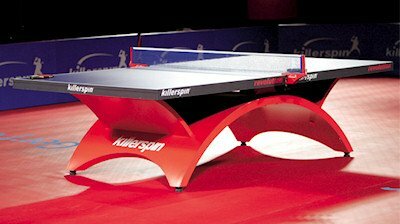 How did the distinctive Killerspin Revolution table design evolve? A. Most of the table tennis tables are designed for just the purpose of playing table tennis. Killerspin wanted to design a product which not only has a good playing surface, but also has a furniture-like quality ... a product which customers like to show off in their living room/special game rooms, rather than normal basements. This table brings sexiness to the sport of table tennis and in today's world it's a very important aspect of everything. Q. Can you tell us about your dealer network and your relationships with them? A. We have around 40 dealers located in the USA and the rest of the world. They help us to develop our table tennis equipment as it's in everyone's best interest to promote the sport of table tennis. We remain in constant contact with all our dealer channels and strive to have a personal relationship with every one of our contacts. Q. Where are Killerspin located and what areas do you serve? A. The main office and headquarters for Killerspin are located in Chicago's loop district (33 W. Monroe Street, Suite 1050, Chicago, Illinois, 60603, USA), but in the near future we are planning on opening a flagship retail location. Q. Please tell us about your web site. A. 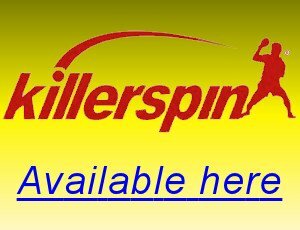 Our web site www.Killerspin.com officially launched in 2002 and there are major updates every few years, whilst minor updates are made constantly. Our web site shows our entire range of products. Q. How do you promote / advertise your business? A. We are involved with several domestic events and players, particularly Biba Golic, who is the face of Killerspin. Biba is involved in every aspect of Killerspin, from design of the products to customer support, and is a critical member of the Killerspin team. Killerspin have also sponsored athletes who've won several major titles, including Commonwealth Games, European titles, US Open, Egypt Open and National Titles. We also have a booth at a select number of venues. We do not typically follow a traditional advertising campaign. We prefer to have advertising as a portion of any marketing effort we are currently engaging. Q. Can you give us an insight into the scale of operation of Killerspin? A. We are focused solely on table tennis equipment, accessories, apparel and customized media content and we process thousands of orders every quarter and we sell hundreds of table tennis tables every quarter.